From the maker of the highly acclaimed Crown Series comes a completely new (and uniquely designed) sub-ohm tank – the Uwell Nunchaku Tank. 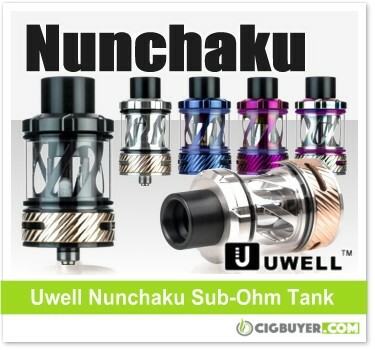 Measuring 25.2mm in diameter, the Uwell Nunchaku Sub-Ohm Tank has an aggressively designed chassis with a protective metal sleeve and stylish grooved base. It features a patented threaded top-fill design with dual bottom adjustable airflow, 5ml of e-juice capacity and Uwell’s new plug-pull Pro-FCOS Coil Technology. It comes with a 0.25 ohm Claptonized A1 Coil (40 – 50W) and a 0.4 ohm Claptonized A1 Coil (45 – 55W); designed for easy installation and leak-free operation while providing an optimal balance of flavor and vapor production.